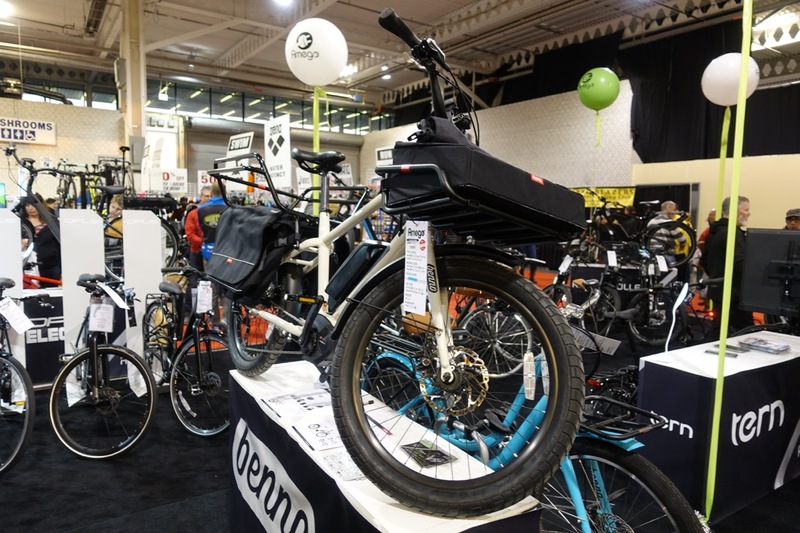 This weekend is the annual spring edition of the Toronto International Bike Show at the Better Living Centre on the CNE grounds. 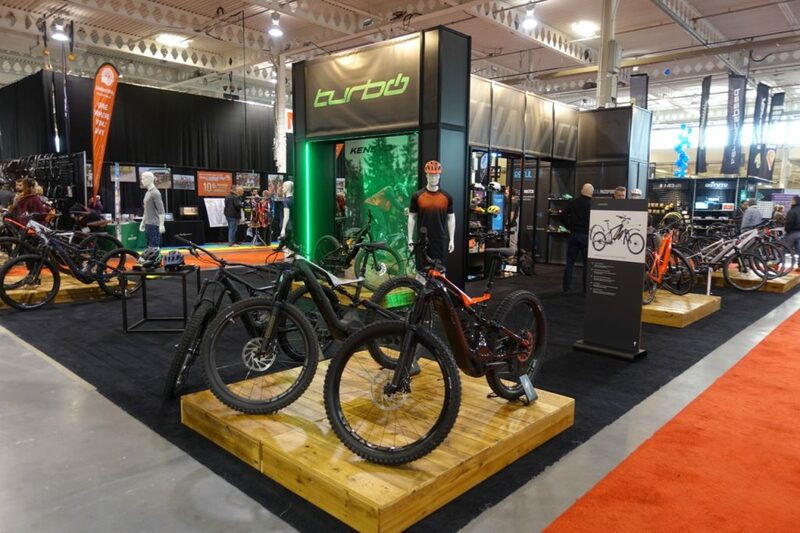 As per usual, much of the floor space is given over to dealers who are selling their current inventory of bikes and accessories. 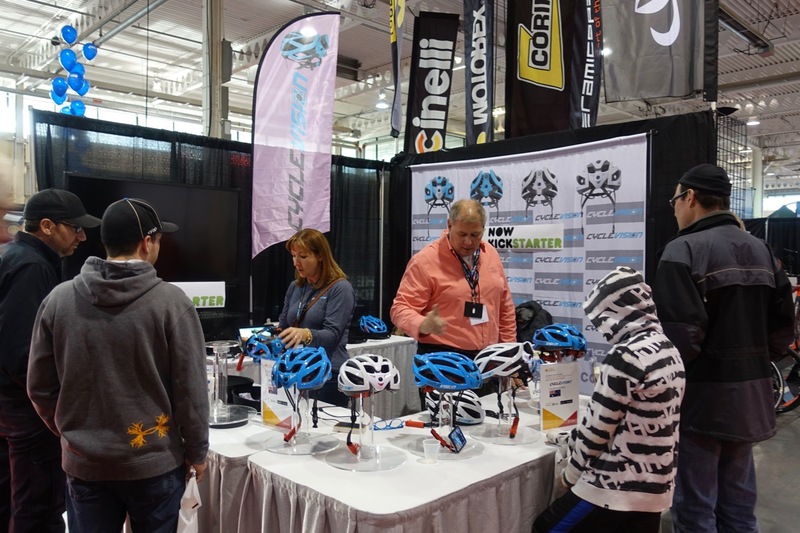 In addition, there are always a range of smaller vendors promoting a wide variety of bike related items or events. 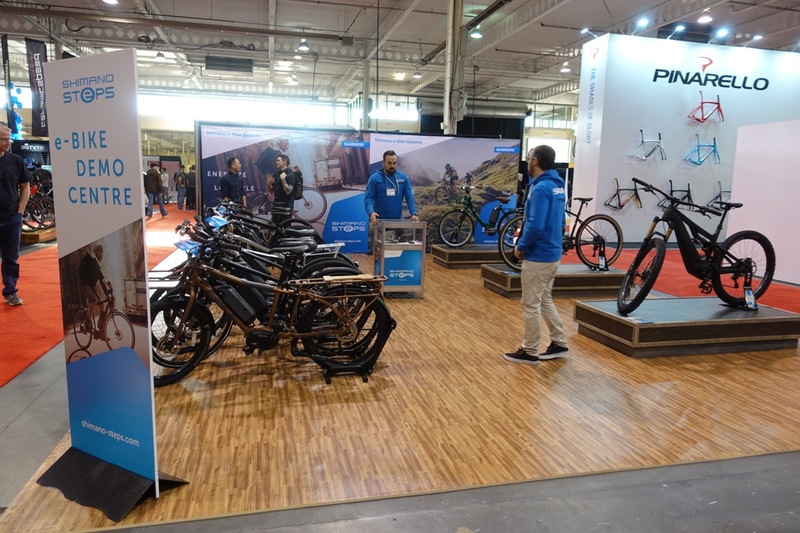 One overall impression was that e-bikes were being seen as a growth area for the bike industry, and they were all over the show. 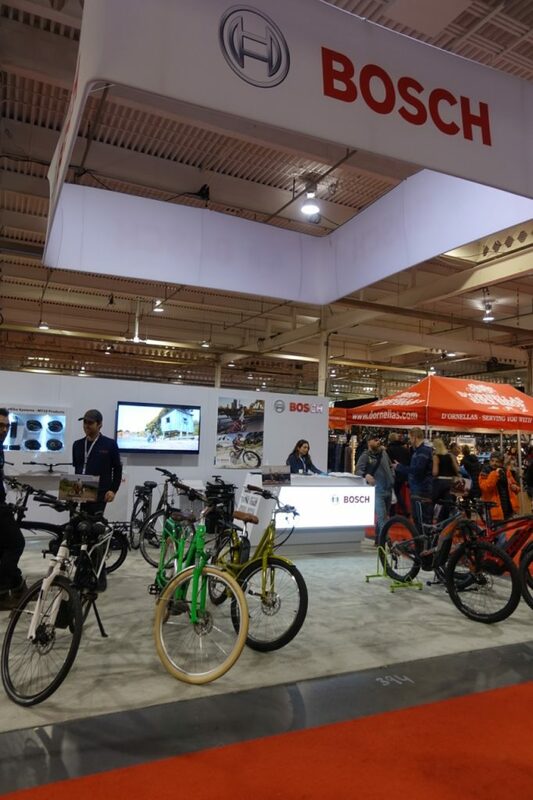 For example, Specialized had a booth for the first time in a couple of years, and as far as I could see, all of the bikes they had on display were e-bikes of different types, ranging from hybrids and commuters to high end dual suspension mountain bikes. 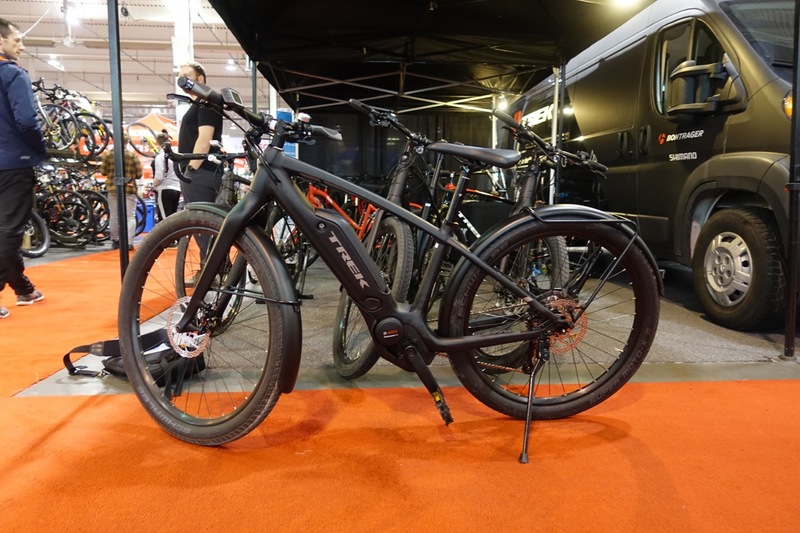 Their bikes were built around a proprietary battery and motor system source from Brose, a Swiss company. The advertising tag line was "busy lives call for faster bikes". 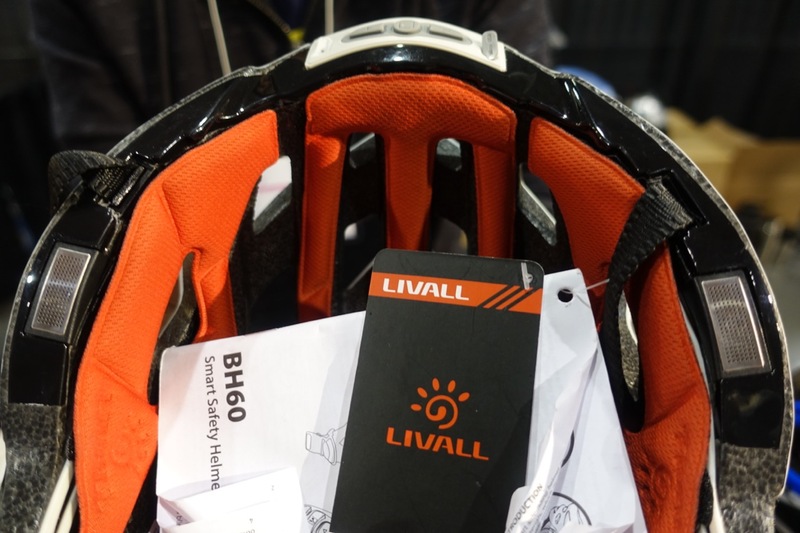 For the racers among us, they also had a system to read the contours of your feet so that a cycling shoe sole could be custom molded, but it didn't seem to be working very well this afternoon. 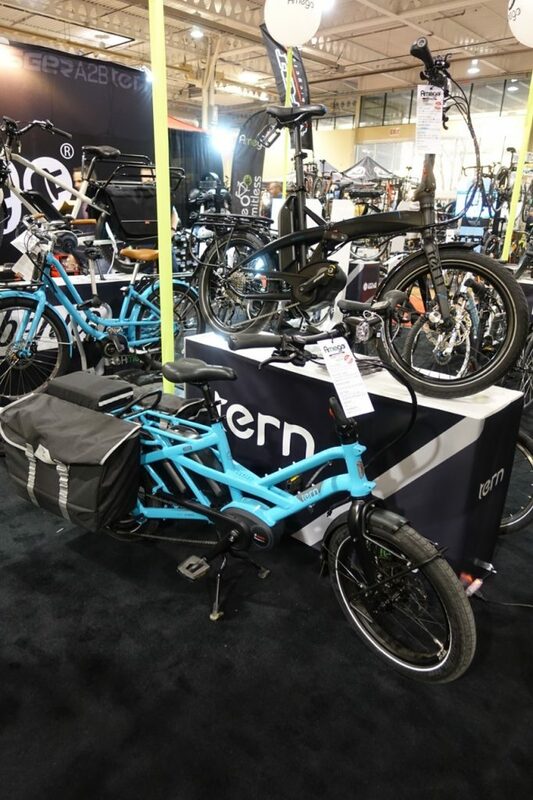 Trek Bicycles had a smaller stand, but it was also e-bike dominated. The Trek representative said that prices were coming down. 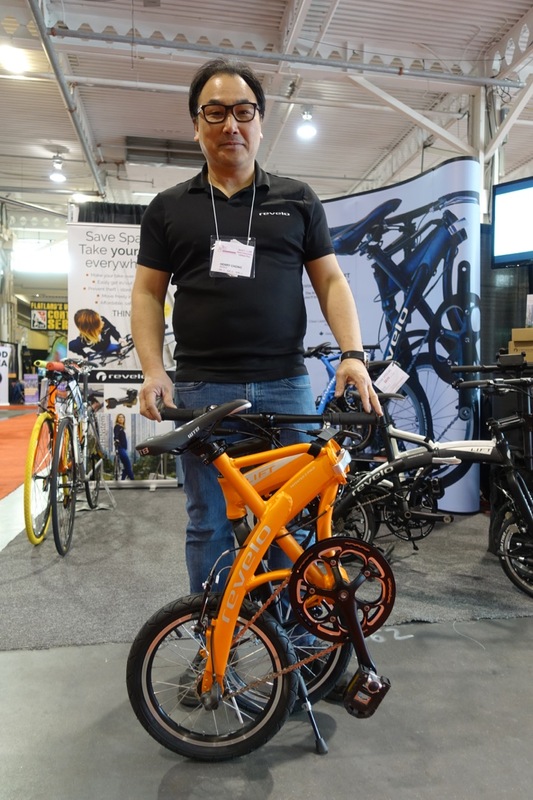 A hybrid model similar to this red one was about $3500 last year, and this year it is $2900 with added features such as built in lighting, fenders and better wheels. 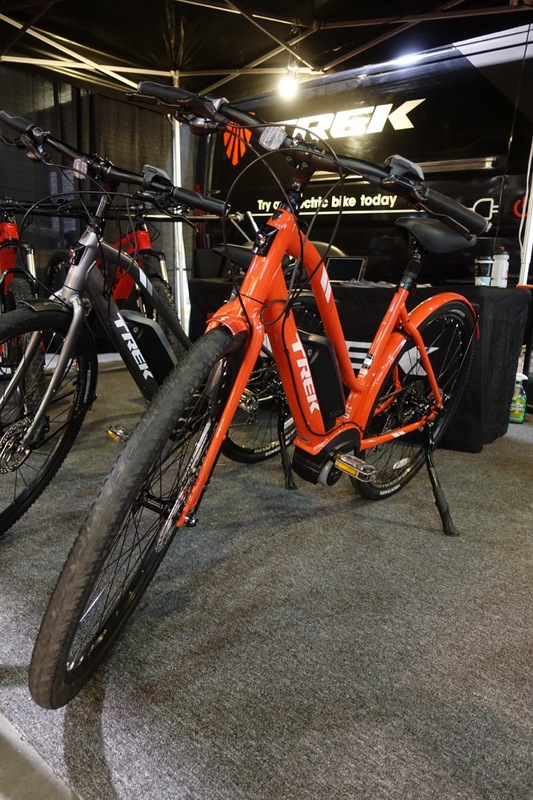 The two main vendors of mid drive motors, Shimano and Bosch, also had large display areas, showing their respective systems built into a variety of vendors' bikes. 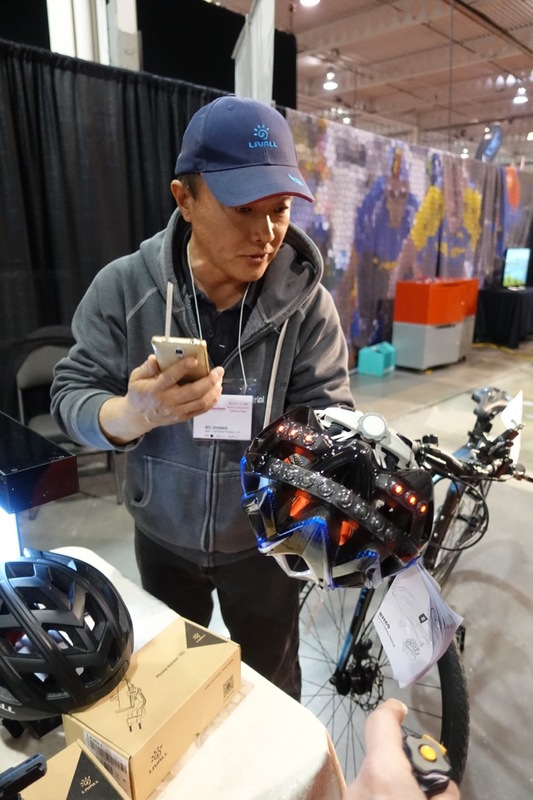 The Shimano rep had moved here from Vancouver a few months ago, and remarked that there seemed to be far more e-bikes on the west coast. We agreed that this was probably because far more people out there actually use their bikes to commute. Excellent bike infrastructure has a lot to do with the increase in bike mode share in Vancouver. The Bosch rep described to be the four levels of motor systems that they have, with varying degrees of torque, depending on the application. 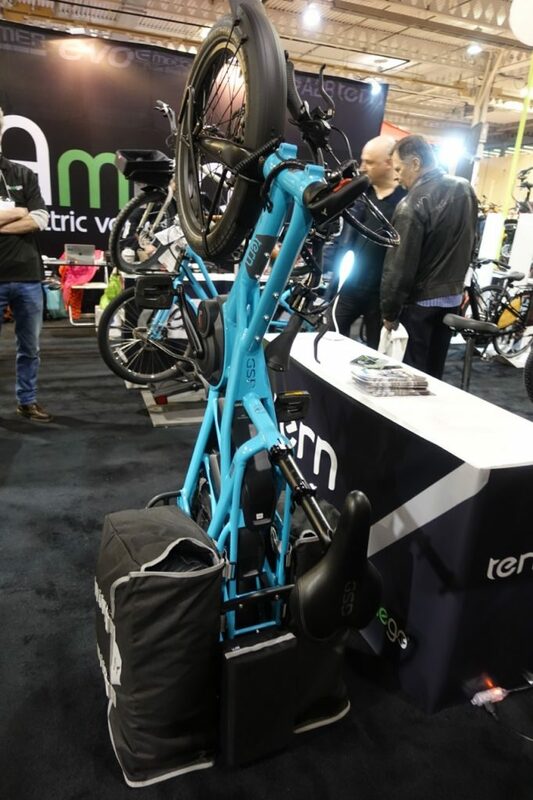 When I told him that I particularly wanted to see a Tern GSD, an e-cargobike based on the Bosch system, he was kind enough to lead me over to the Amego stand, where they actually had one on display. 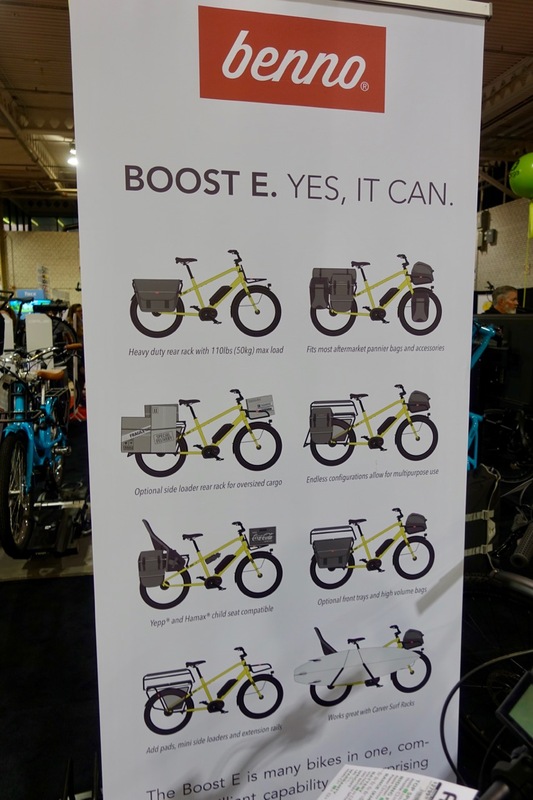 Amego Electric Vehicles is apparently the largest e-bike dealer in North America, and I had no idea that their showroom was at Portland and Richmond, right downtown. 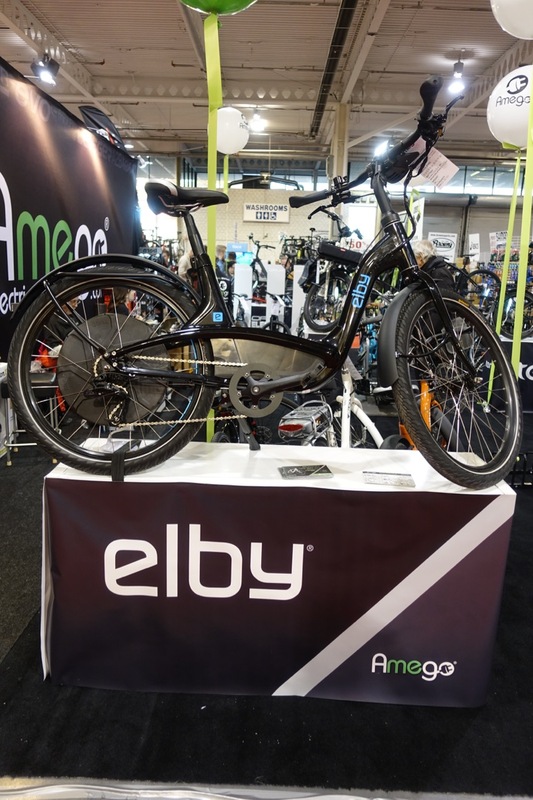 They carry a wide variety of e-bikes, starting from basic models under their own brand to the highest end models available from Europe. 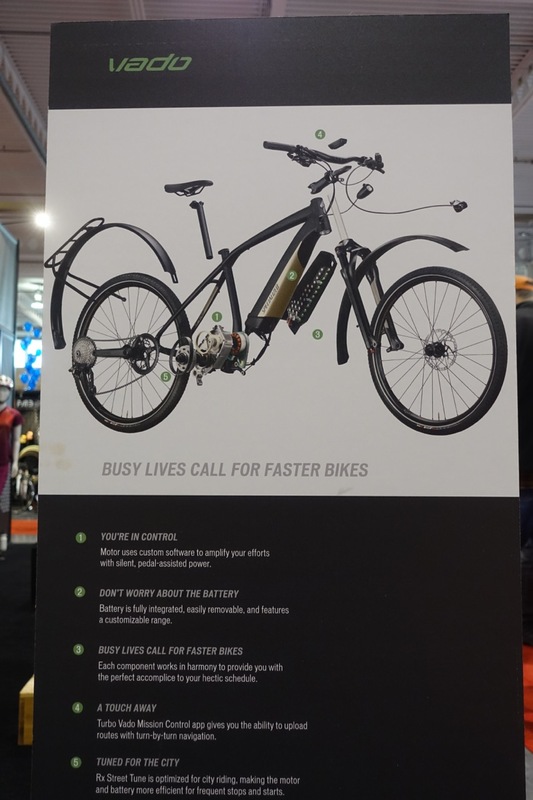 Here is an elby, which is BionX's own brand of complete e-bikes. Elby is based in Toronto. 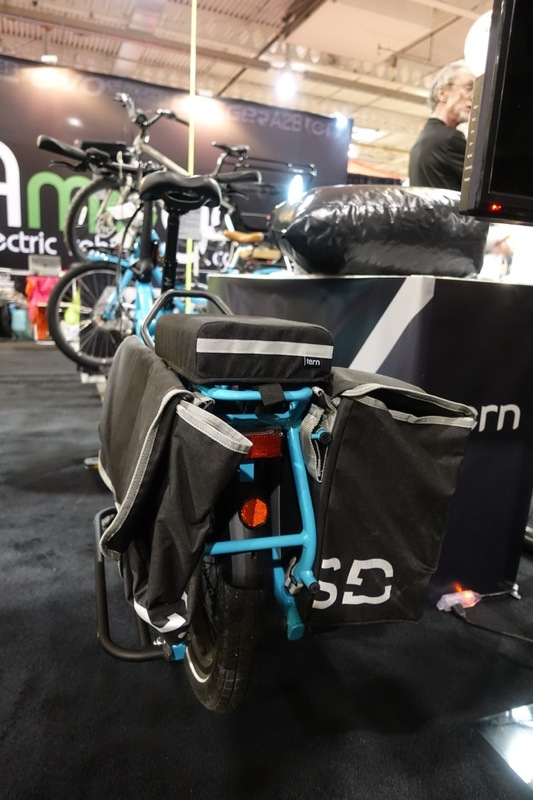 A nice family oriented cargo e-bike by Benno. However, I was most anxious to check out the aforementioned Tern GSD, a compact long tail that has been getting rave reviews. GSD stands for "get stuff done". There aren't too many in the country yet, and so this weekend is your chance to see one in the metal. It can be configured with two child seats in the back. This one had two huge sidebags and a simple seat pad. The side bags fold neatly when empty. It also stands on end for storage, just like my Bike Friday Haul a Day. 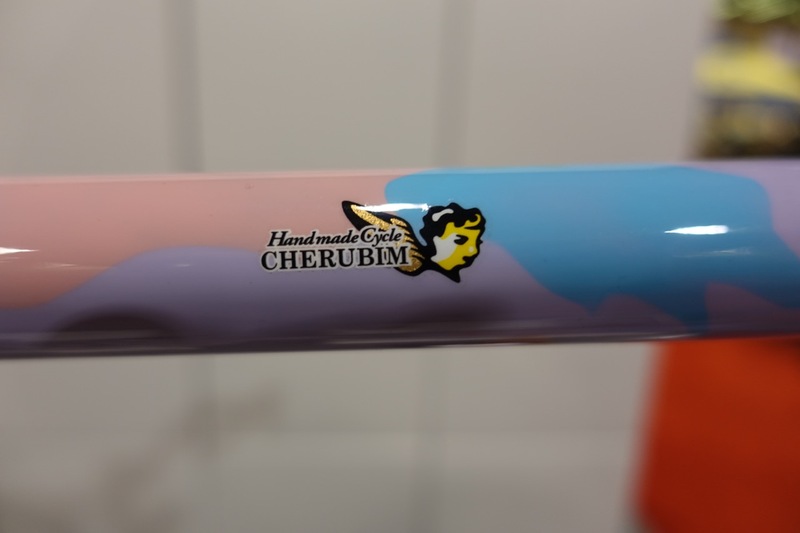 The handle bar folds in as well, although the frame itself does not fold. My short test ride was a blast. E-bikes were not the only thing on display. 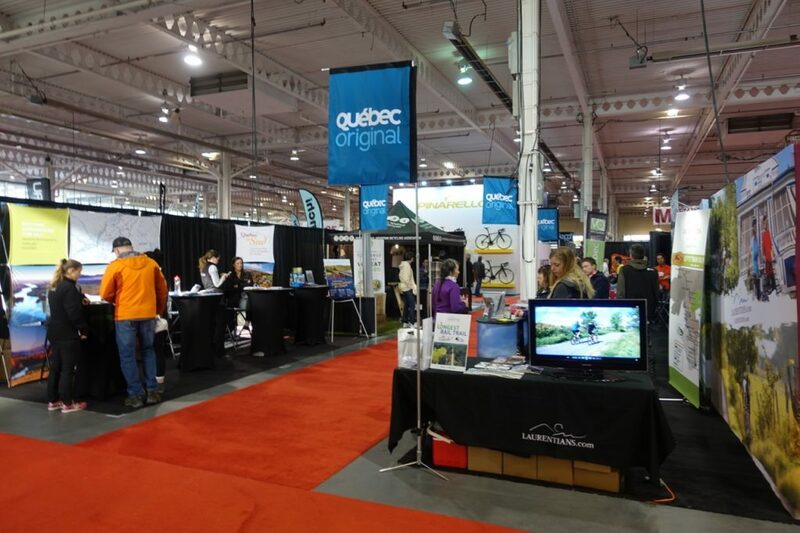 The bike tourism area had a massive series of booths from Quebec. 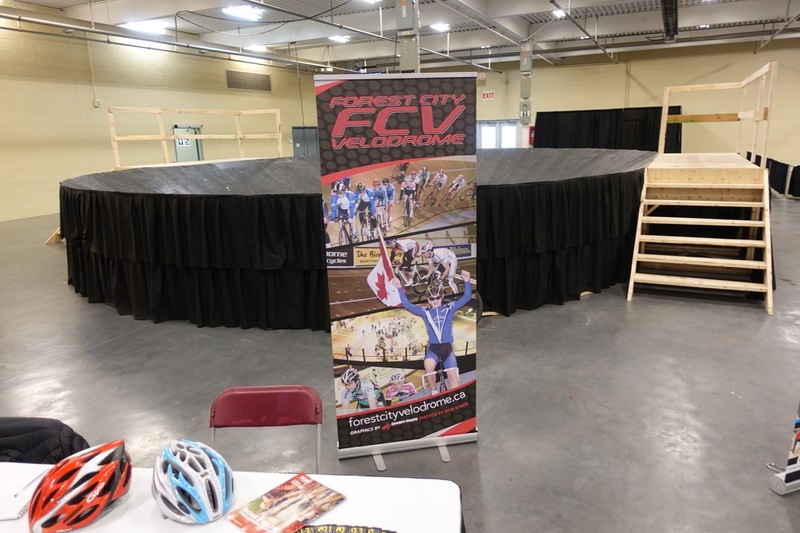 Forest City Velodrome bought along a scary looking mini version, but unfortunately no one was riding it while I was there. 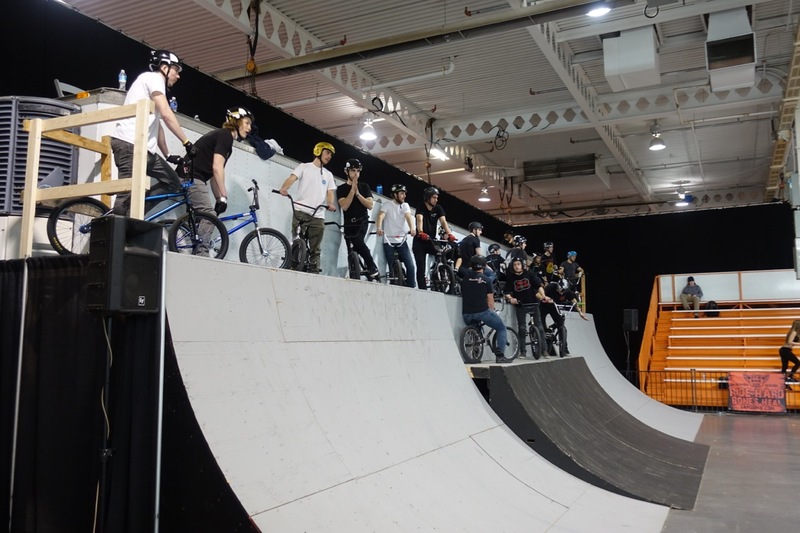 As per usual there was a large area devoted to BMX riders. 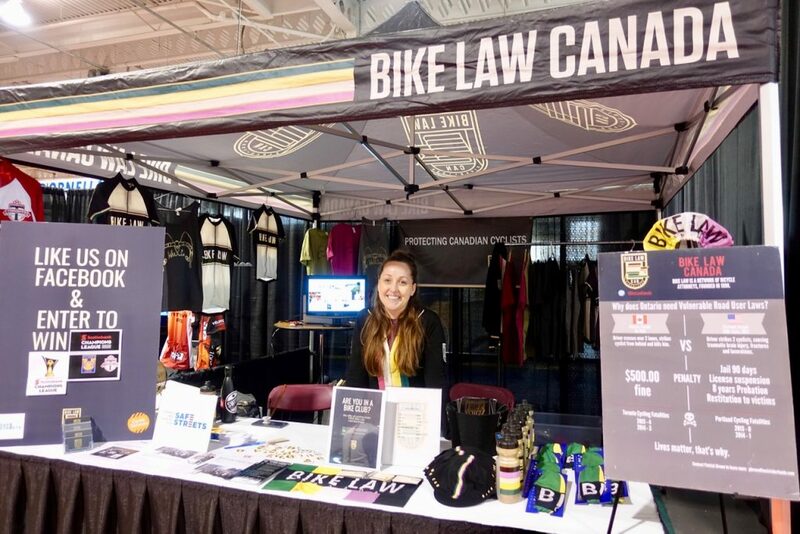 Melissa representing our friends at Bike Law Canada. 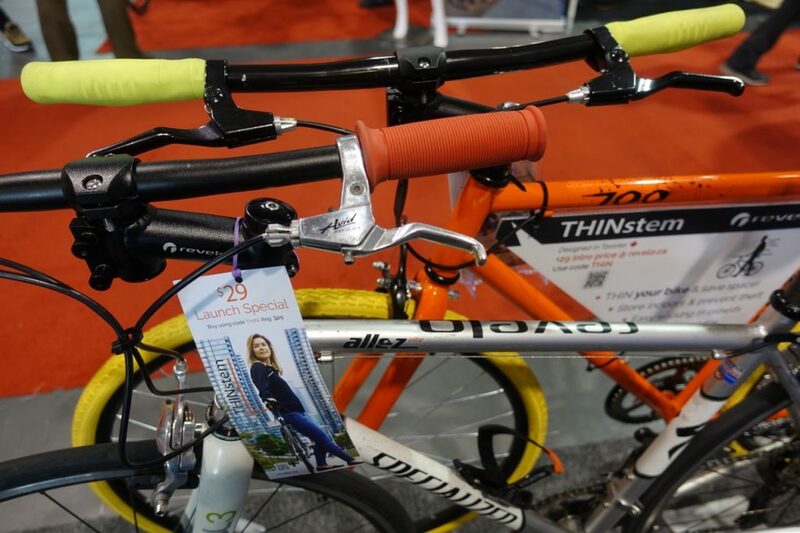 Bike Law advocates for changing the laws regarding cyclist safety, in particular promoting vulnerable road user legislation, as well as providing legal advice for cyclists. 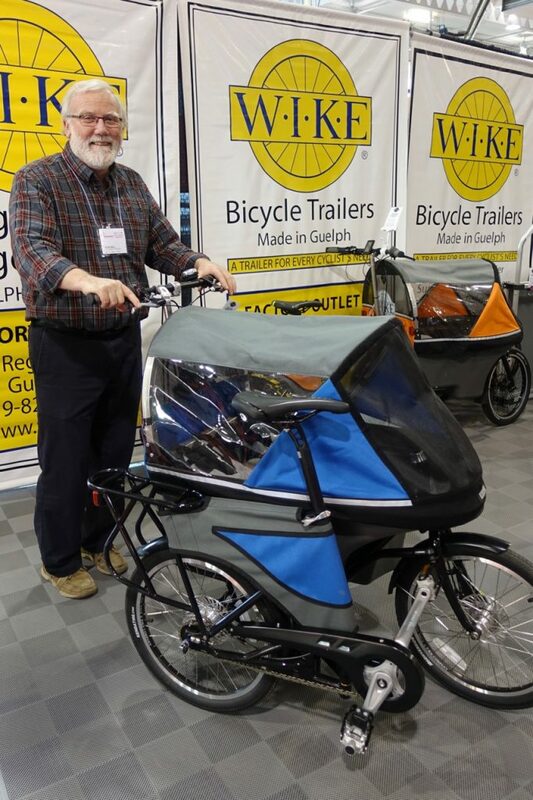 Bob Bell from Wike was back with his unique Salamander: a cargo bike that converts to a stroller. 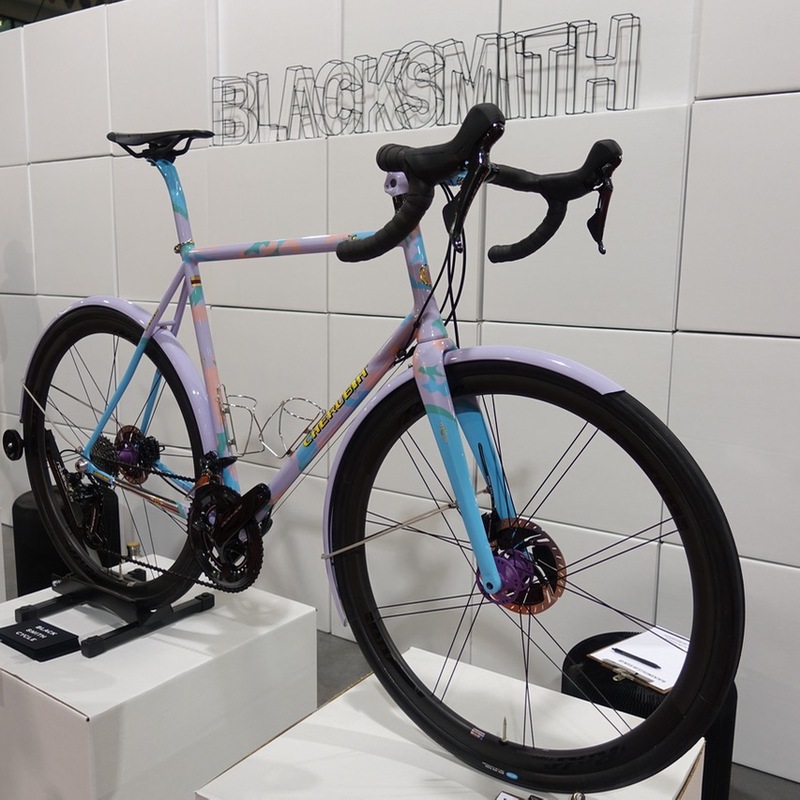 This bike was at the show two years ago as a prototype, now they have plenty in stock, and there is a choice of fabric colours as well. This bike does break down to be shipped in two UPS boxes. They had just shipped one to Denmark. 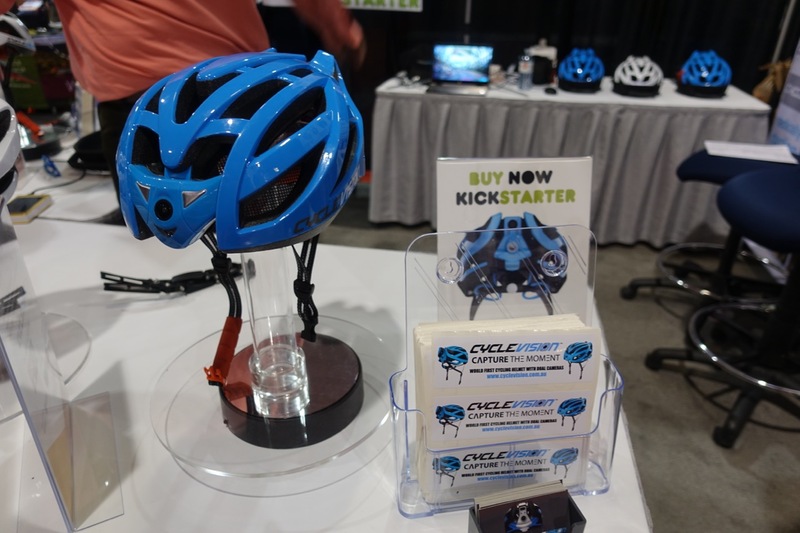 These friendly folks from Australia were promoting their smart helmet, the Cyclevision Edge, that has two 160° HD cameras front and back. 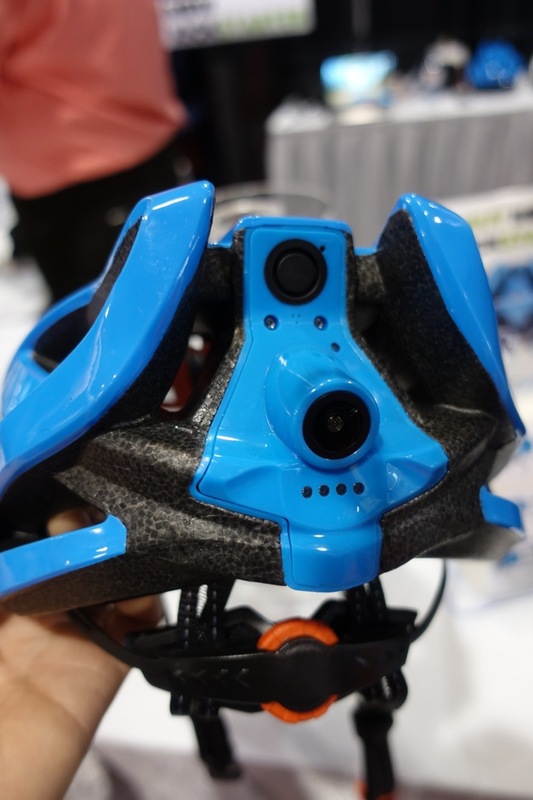 It is currently on Kickstarter, but at the show you could see it for real. Here is the rear facing camera. 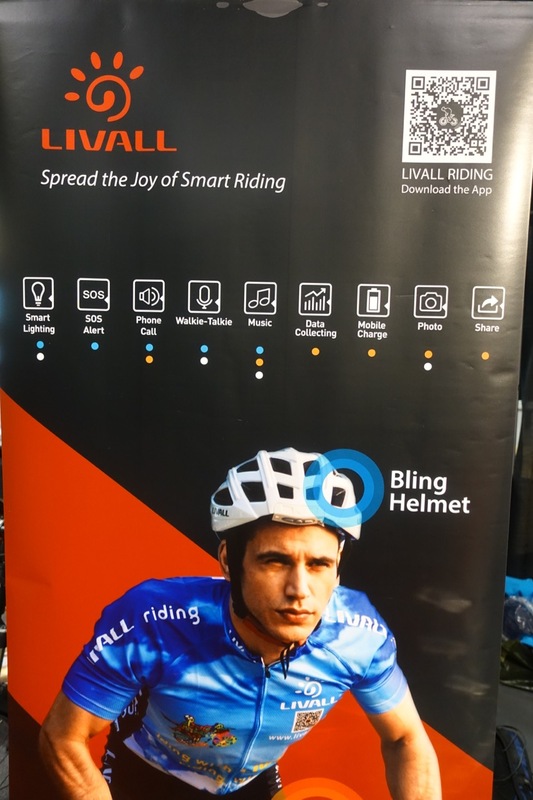 There was a Chinese company also selling a smart helmet that looked like an upgrade from a similar unit two years ago. 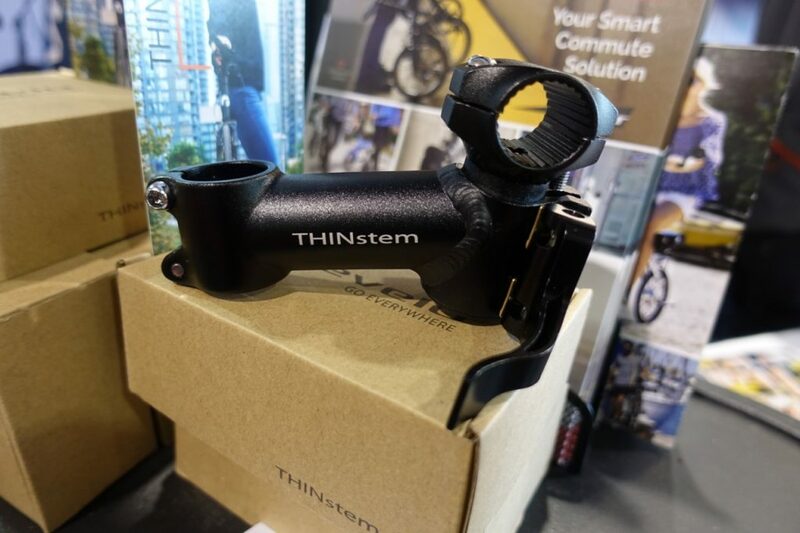 It has lights and turn signals, and this year they've added a bluetooth connection to your phone. Here is the vendor calling the helmet. This picture shows the built in speakers. This is Henry Chong, inventor of the Revelo folding bike. 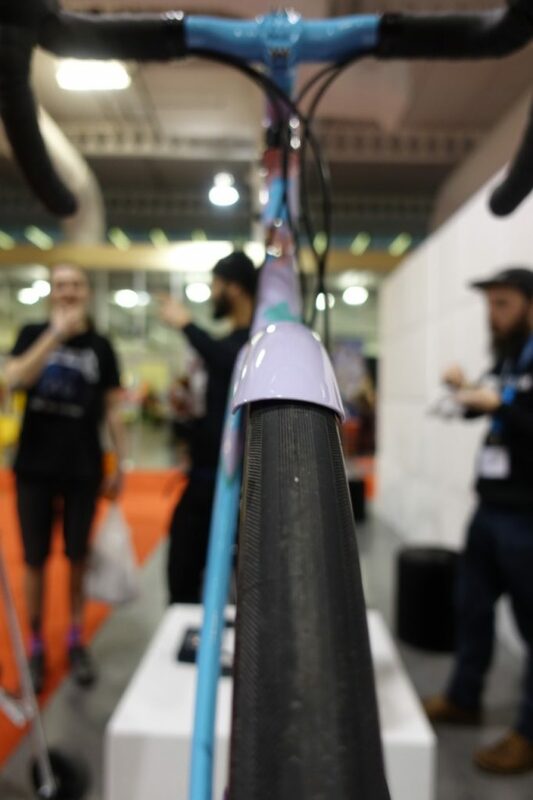 He was also showing a very clever stem that allows the handlebars to pivot sideways for more compact storage. This pictures shows how much storage could be saved. 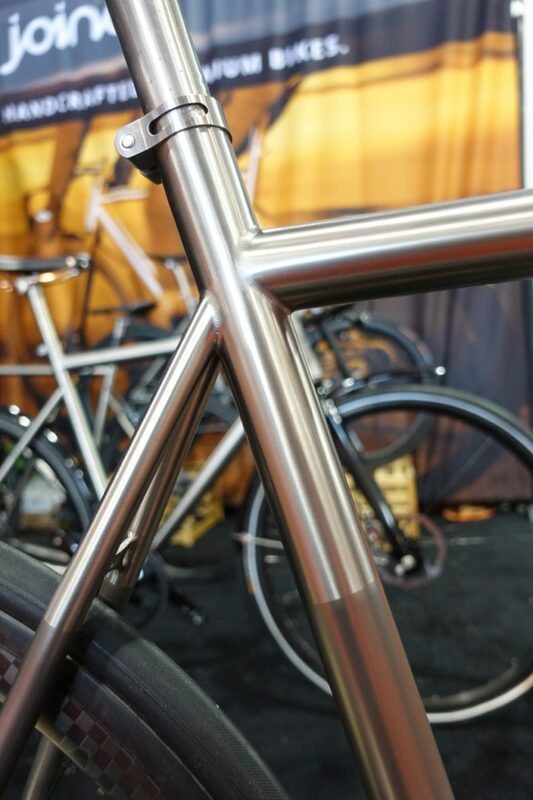 I was told that this initial version is for 25.4 mm clamp diameter bars, but one compatible with oversized bars is due later this spring. 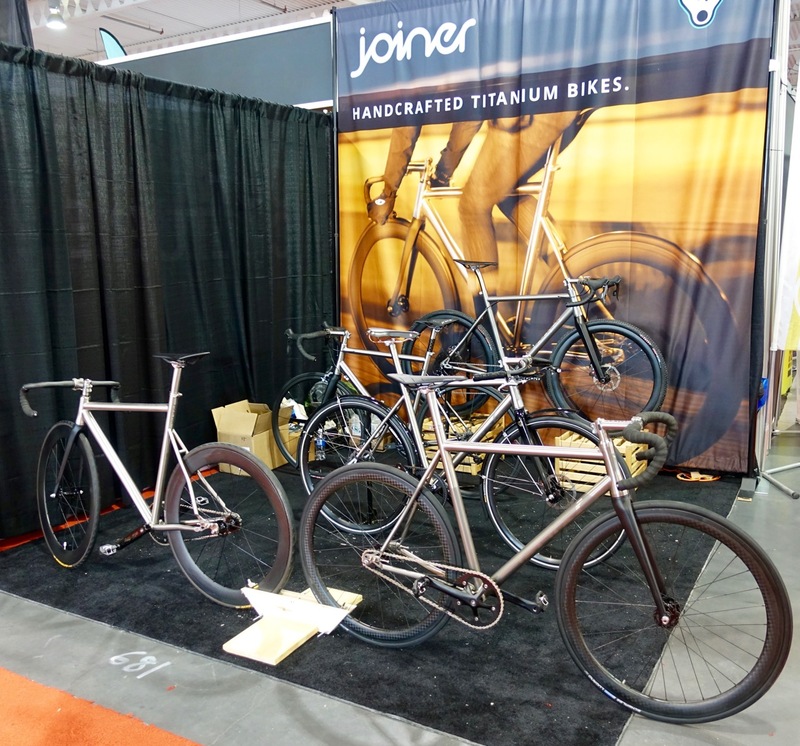 Joiner is a new Toronto based vendor for titanium and carbon bikes. The quality of welding on this bikes was impressive. 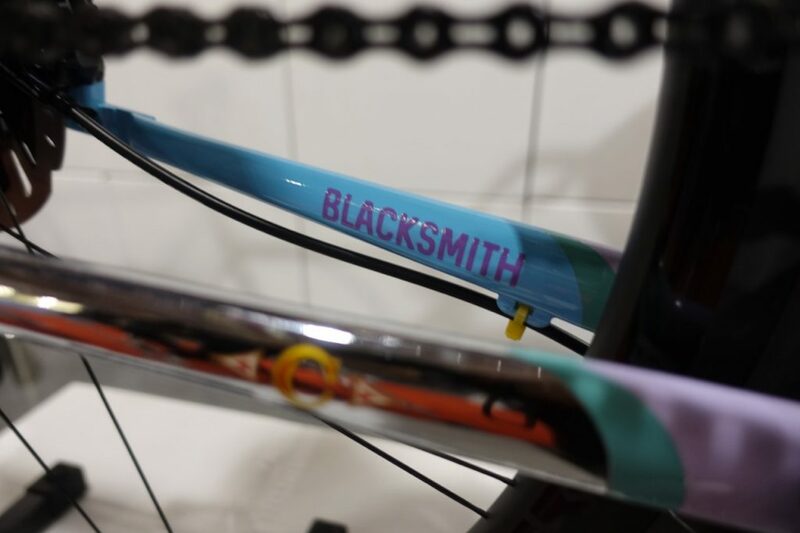 Last but not least, Blacksmith Cycle had asmall stand with three dream machines. 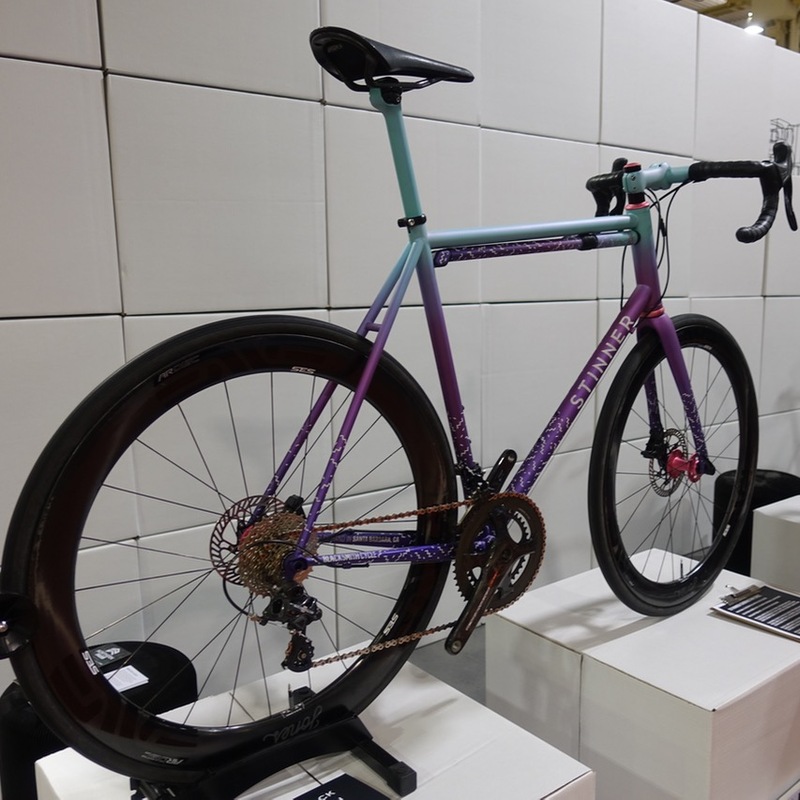 I was particularly taken by this gravel bike by Cherubim, the first one I've seen outside of Tokyo. 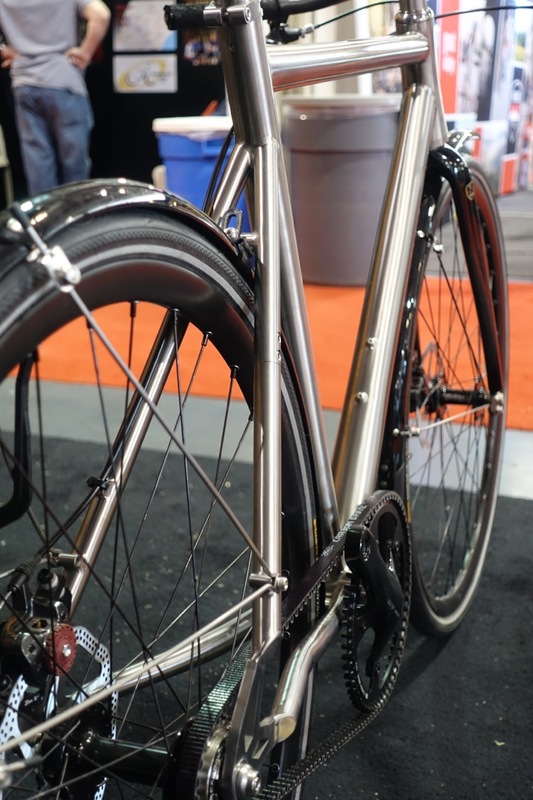 With the beautiful paint and detailling, one gets the impression that this bike will never actually see gravel. On the other end of the stand was this bike by Stinner. 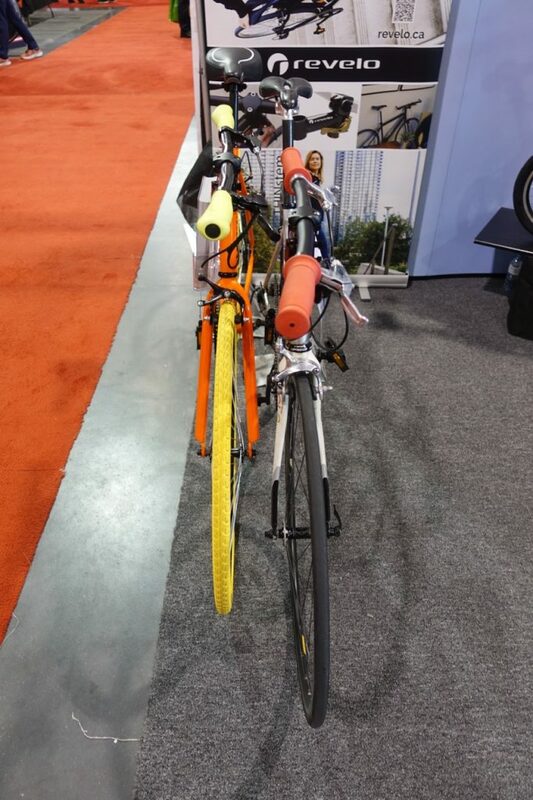 I would have taken a picture of the middle carbon bike, but there was always a crowd around it. 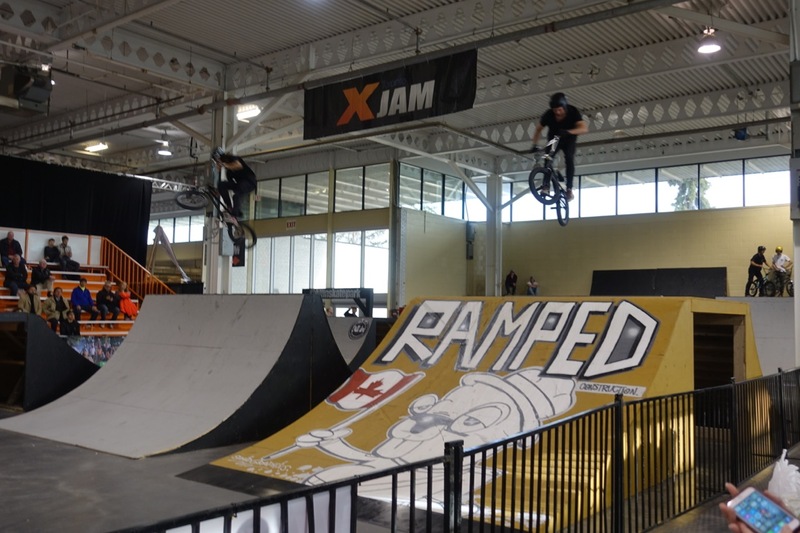 In summary, the show runs this weekend from 10-7 Saturday, 10-6 Sunday. Lots to look at, and perhaps some good deals to be had as well. Bear in mind that the ex grounds will be very crowded on Saturday for the Toronto FC home opener, which will be right next door.